This one man UB40 tribute show stands high amongst other UB40 tributes with the star of the show perfectly recreating the mellowing sounds of UB40. Shaun.e.b has put this show together as a tribute to his lifelong favourite reggae band that he grew up as many of us did. Being a solo act means it's now possible to book a UB40 tribute act for your venue or event for just a fraction of the price that you would pay for a full UB40 tribute band, as a solo act Shaun.e.b can fit spaces and budgets that bands don't. The UB40 tribute show can cater for any kind of function including birthdays, engagements and weddings and is available for any kind of venue from Hotels to pubs, clubs or even garden parties. Different packages are available to fill your whole evening and cater for your needs. The UB40 Tribute Show is fully self contained and will travel any distance to make an appearance both in the United Kingdom and abroad. 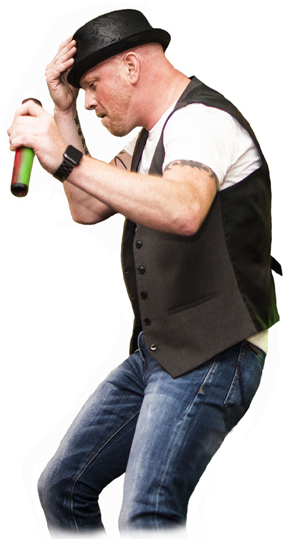 As well as being a fantastic singer Shaun.e.b is a great entertainer and the UB40 tribute show is one not to be missed.